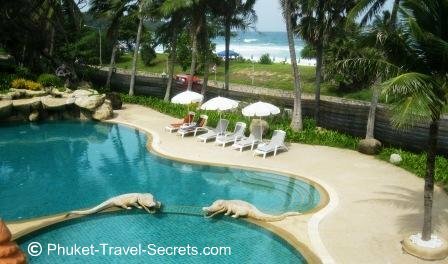 The Thavorn Palm Beach Resort is located at Karon Beach on the southwest coast of Phuket. This expansive four star beachfront resort is set over 25 acres in a peaceful area of Karon. The Thavorn is within walking distance to the shopping, restaurants and entertainment in both Karon and Kata. Apart from being central located to all the amenities in both Kata and Karon, the Thavorn is situated just across the road from the beautiful Karon Beach. 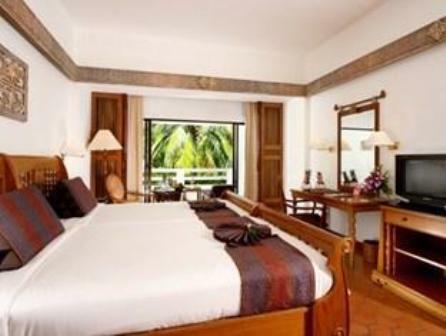 There are 209 rooms at the Thavorn Palm Beach Resort and a variety of room types available. Including standard and deluxe rooms and a range of one, two and three bedroom suites to suit all tastes and budgets. We found the rooms at the Thavorn Palm Beach to be rather spacious and the room rates are very reasonably priced with breakfast included it was good value for money. All rooms at the Thavorn Palm Beach Resort have balconies or terraces with views overlooking the pools, tropical gardens or ocean. The grounds of the Thavorn Palm Beach are simply amazing. 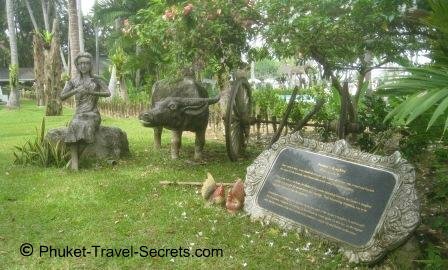 Within the resort grounds you will find an oasis of tropical gardens filled with native orchids, lily ponds, fish ponds and Thai sculptures. The Thavorn Palm beach boasts five stunning swimming pools, as well as a range of other facilities and services that are available. There are many features that make the Thavorn Palm Beach Resort ideal for family vacations. The main feature would have to be the maze of beautiful pools that the kids have to choose from. 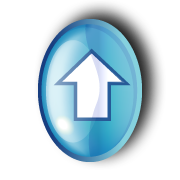 As well as the kids play area and babysitting services that are available. The Thavorn Beach Resort has an excellent variety of bars and restaurants to choose from. One of the best spots is the Long Beach Terrace where you can enjoy stunning ocean views and evening sunsets from any one of the three restaurants. You can choose from fresh seafood at the King Prawn Seafood Restaurant, or char grilled meats at the Palm View Steak & Grill. There is also authentic Italian dishes at Il Pirata restaurant or just enjoy listening to live music from 6.30 pm to 10.00 pm on the Terrace everyday except Sundays. Set within the picturesque gardens of the resort you will find the Wingsong Café. The cafe is open for breakfast, lunch and dinner and has a good selection of International cuisine. You can sit either inside or outdoors overlooking the garden. 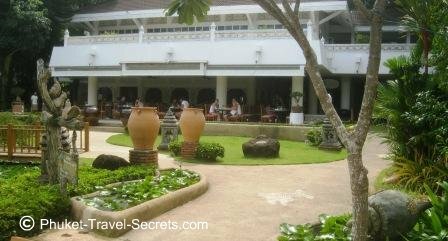 The resort also has a new Mexican Restaurant Mariacha, as well as the very popular and newly renovated, Old Siam Restaurant. 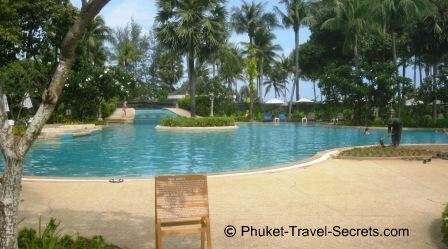 The Thavorn Beach Resort provides a free shuttle service for you to go into Patong. You will need to book this service at reception. 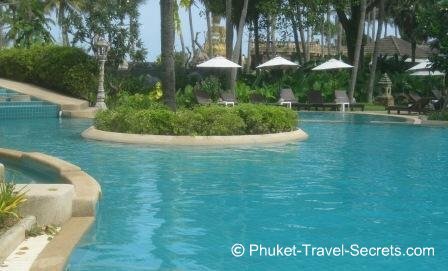 During one of our many trips to Phuket we had a short but enjoyable stay at the Thavorn Beach Resort at Karon. The breakfast was great with a good selection to choose from. The pools are fantastic and are ideal for kids, there is also plenty of sunbeds around the pools. 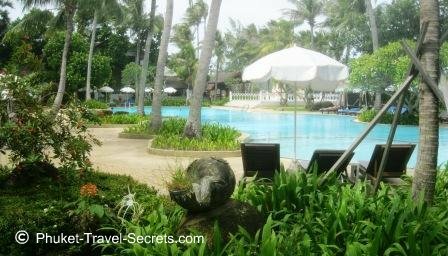 The resort is by no means a new resort, however we found our stay at the Thavorn at Karon Beach to be good value for money and positioned in a great location. Just up the road from the resort is a 7 Eleven as well as a row of good restaurants. 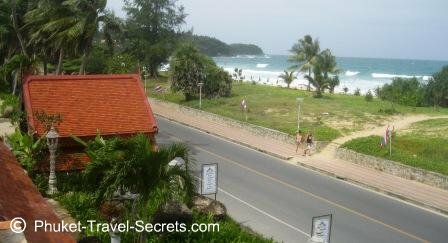 Across the road you can hail down a local bus to take you into Phuket Town, there is also ample tuk tuks and taxis. The Thavorn Beach Resort is a good choice for kids of all ages, read hotel reviews to see what other families have said about their vacation at the Thavorn. Or if your still not sure, read what other guests thoughts about their stay at the Thavorn Palm Beach Resort at Karon in Phuket on Tripadvisor.